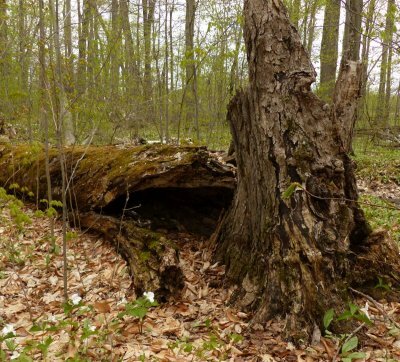 Walking through our local forests and along trails at the city’s edge, your eye may be caught by the stark form of a standing dead tree or by a fallen log stretched across the forest floor. 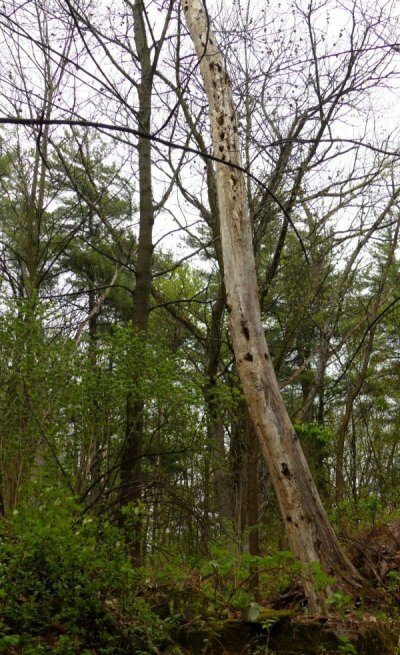 Perhaps you have seen a woodpecker fly from a hole in the tree’s trunk, or noticed a squirrel running along the log, using it as a sort of elevated highway through the forest, and recognized the value of this dead wood to birds and other forest creatures. To many people, however, standing dead trees represent a threat to their safety, or an eyesore to be felled. Yet these standing dead trees and downed logs are an important feature of forest ecology. Although writing of the Pacific Northwest, his words ring true for our forests as well, albeit with some species difference. Snags are standing dead trees. They are also known as den or cavity trees and, increasingly, as wildlife trees. The latter term is especially appropriate for their value to wildlife is immeasurable, as they provide food, safe nesting sites in the form of cavities and platforms, roosting and denning sites, hunting perches, display stations, and foraging sites for a wide variety of species (Guy 1994). Not all snags occur within a forest. Sometimes isolated trees, left standing by design or chance, hold a lonely vigil over fields or cottage lots, or some other cleared area. These, too, represent an important wildlife resource, offering nesting platforms for Ospreys (if near water), or hunting perches for flycatchers, Eastern Bluebirds, swallows and other birds, as well as food in the form of invertebrates inhabiting the tree. In human terms, most species of trees are effectively immortal, but urban and suburban environments can be stressful in various ways, and trees may be killed by disease or insect pests, various problems with water, light, and nutrients, and especially by disturbances inflicted on their root system. The primary “colonizers” of snags are insects and fungi, which soften the wood allowing it to be easily shredded by birds and mammals. If you usually think of insects as pests, you might be surprised to find out that they’re essential to all the other wildlife species that depend on or make use of cavities. The variety of invertebrates inhabiting dead and dying trees is staggering: millipedes, mites, earwigs, beetles, spiders, ants, and even earthworms These insects then attract woodpeckers and other forest-dwelling animals who in the course of excavating for food, create holes or cavities that become, in turn, nesting sites for birds and small mammals. 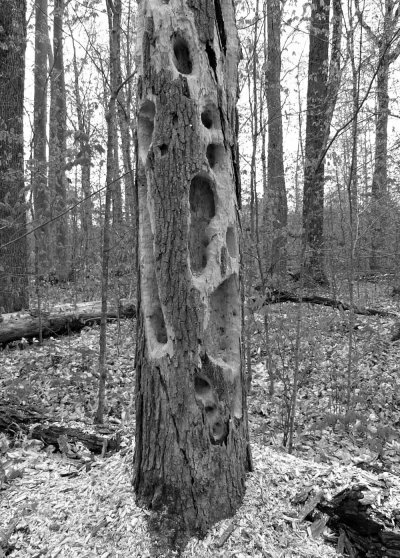 Biologists call those species that greatly influence other species, “keystone species.” Woodpeckers are one such example, for the holes they create as they search for food provide homes for countless other creatures. Fungi also provide food for other creatures, as well as being used by many insects. A standing dead tree can remain in place for many years. Smaller trees come down sooner, but even they can last for many years, and this should be remembered when considering the “safety” aspects of snags in public places. An old-growth forest is full of fallen trees, or downed logs, whereas in second-growth eastern hardwood or pine forests, logs are much less in evidence. Yet even here they form an important part of the overall ecosystem just as they do in any forest or wooded area. In fact, biologists are now calling logs the “hot-spots” of the forest ecosystem. When a tree falls to the ground, it is quickly taken over by insects, especially beetles. Earlier, woodpeckers were referred to as a keystone species; beetles serve that same function in downed logs (Norse 1990). As they bore into the log they open up the way for fungi, which in turn help to decompose the inner bark. As the beetles tunnel further into the log they provide access for spiders, ants, millipedes, and salamanders and the process of decomposition initiated by the beetles continues. 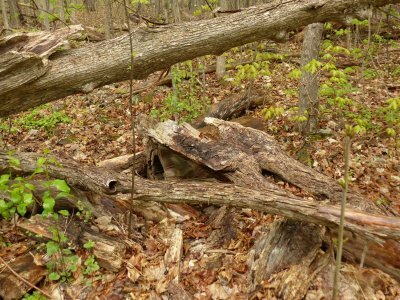 Like snags, downed logs provide shelter and denning sites for mammals, birds, and for amphibians and reptiles such as salamanders and snakes. Small animals such as squirrels use logs as easy routes through the forest. Ecologists have classified five stages of decay in a downed log, from the first stage when a log is intact and not yet decayed, to the fifth, where the log has crumbled into a mass of organic material. Because logs are more moisture-retentive than snags they decay more slowly since oxygen is excluded from wet wood (Norse 1990). Large old-growth logs can take 200 or more years to decompose completely. Smaller logs, such as those found in this region, will decay much faster. 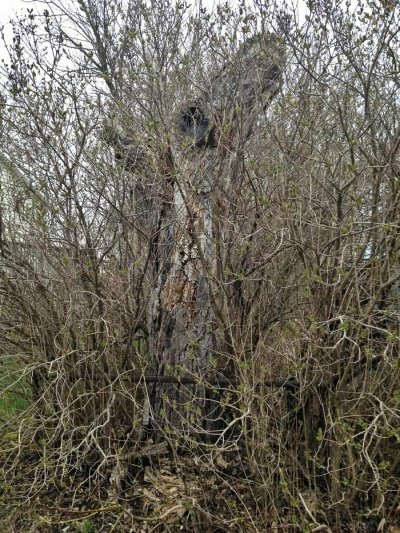 According to Owen Clarkin, it has also been pointed out that various woody plants require a good layer of coarse woody debris in order to regenerate. Thus, not only standing and fallen dead trees, but stumps and other woody debris contribute to the overall ecosystem of the forest and the wildlife therein. Many people perhaps do not realize that when they put up nest boxes each year they are offering homes to cavity-nesting birds whose natural nest sites are holes (or cavities) in snags; hence, the use of the terms den or cavity trees. Some of our most familiar birds are cavity-nesters along with numerous other species, perhaps less familiar. However, nest boxes can never be a complete substitute for natural cavities, for while certain species readily adapt to man-made nest boxes, many others will not, or cannot adapt. Not all birds make use of the cavities in snags for nest sites. For some birds, such as the tiny Brown Creeper, it is the loose bark on dead trees that gives shelter for nests, while for others such as Ospreys, standing dead trees near water provide platforms on which to build their large, bulky nests. Not all uses of wildlife trees are for nesting purposes. Ruffed Grouse use downed logs for “drumming” in their spring courtship ritual. And as noted earlier, many birds use snags as hunting perches or display stations. Mammals also make use of snags for both shelter and for rearing young. Martens, weasels, squirrels, other small rodents, bats, even bobcats will den up in cavities. Black bears may sometimes find winter refuge at the base of large snags, as well as in hollowed out downed logs. Squirrels and chipmunks and other small rodents use logs as forest highways. As noted earlier, a multitude of insect species thrive on dead and dying trees whether standing or down on the forest floor. In turn, these insects provide much needed food for a variety of wildlife. When these trees are removed from the forest ecosystem, the insects associated with them are also removed, and in turn, the wildlife that feed upon the insects. If your standing dead tree is quite large, you may be worried about heavy falling branches. Cut away some or all of them and leave the trunk. If you still think the snag is too tall and overpowering, topping the trunk to a reasonable height might be a solution. A “reasonable height” depends on what you feel comfortable with and what is in the immediate vicinity of the snag (i.e., your house, neighbouring houses). But if you cut the snag back too much, you might as well fell it completely and leave it as a log; it will have little value as a nest site if it is only a couple of metres tall. Naturally the best thing to do is nothing, leaving the tree to take its own course, but in a small suburban lot, safety concerns must be evaluated. If you’ve left the snag at 4.5 metres or better, but want to disguise it somewhat, plant lightweight climbers such as wild cucumber vine (Echinocystis lobata) or native clematis (Clematis virginiana) to twine up the trunk. You’ll need to provide some support for these vines to get started. Virginia creeper (Parthenocissus quinquefolia) and wild grape (Vitis riparia) grow fast and can quickly cover a snag with a dense green cover, but these vines are very heavy and can hasten its collapse. If you want to “dress up” your snag, you can hang seed feeders from its branches or from simple hanging brackets. Suet feeders can be affixed right to the trunk. If you really want to turn your snag into a work of art, hang flower baskets as you would the feeders. Plant them with nectar-rich flowers for bees, butterflies and hummingbirds (see the FWG information sheet on butterfly gardening). When the snag eventually collapses you can either leave it where it falls, or move it to a more remote part of your garden where it will continue its work of feeding insects, birds, and your soil. If your neighbours complain about your snag, tell them what you are doing and why; you might change their way of looking at standing dead trees. It is only by changing how we view the land around us that we can begin to help restore and nourish both it and its wildlife. Guy, Stewart. 1994. More than dead wood. Protecting the wildlife tree resource in British Columbia. BC Naturalist 32(1): 4-6. Kennedy, Des. 1991. Death of a giant. Nature Canada 20(2): 18-26. Norse, Elliott A. 1990. Ancient forests of the Pacific Northwest. Island Press. This is the third in a series of suggestions from the OFNC’s Conservation Committee for things you can do around your home in aid of wildlife and conservation. They are all based on personal experience – ours and colleagues’. We would love to hear your thoughts about these practices and your experience with them – good or bad. And your suggestions for further good practices are very welcome. In 2015, we learned how to build simple mason bee boxes out of recycled materials. Unlike many “gadgets” purported to help wildlife, these actually work. Mason bees laid eggs in the paper tunnels we made for them, the eggs hatched and completed the life cycle, and the progeny are busily pollinating our fruit trees right now (spring 2016). Mason bees are named for their use of mud or clay in their “nests.” They belong in the genus Osmia in the family Megachilidae. At the Fletcher Wildlife Garden, we have found Blue Orchard Mason Bees (Osmia lignaria) as well as at least one other unidentified Osmia sp. Species in this family are very good at pollinating fruit trees. They have only one generation per year, and the adults emerge from their overwintering nests just as serviceberries, wild plum, and cherries are blooming. They are closely related to leaf-cutter bees, which will also use bee boxes, but emerge later in the spring. In April-May, adults emerge from overwintering sites and start looking for an appropriate place to lay eggs. Once they’ve found a tunnel, they gather pollen and nectar from fruit trees, and, in the process, ensure a crop of apples, cherries, plums, or berries for us humans. Mason bees also need a source of mud, which they use to seal each cell inside the tunnel after filling it with a pollen-nectar pudding and laying an egg. Adults live 4-8 weeks. The eggs hatch in about a week and the larvae begin to eat the food left for them. By late summer, they are ready to pupate. In September, the pupae open and adults emerge but stay inside their cocoons all winter, coming out the following spring. Mason bees do not dig tunnels; instead they look for “natural” tunnels, such as hollow plant stems or twigs or the abandoned nests of other insects. They are readily attracted to paper tubes. Drilled holes in wood are also an option, but both types of tunnels should be replaced every year to minimize parasites and disease. Drilled holes in wood can be lined with parchment paper to make replacement easier. In spring 2015, we had a workshop at the FWG to learn to make a simple mason bee house using a milk carton and paper tubes (the instructions are below). The advantages of this type of nest box is not only the low cost, but they are also easy to make, long enough to hold many chambers, and they can’t be broken into from the sides. Jenny Sheppard was our instructor and her technique is based on a system developed over many years by Richard Scarth of Vancouver. We put two of these nests into our “insect hotel” located on the south side of our Old Woodlot. The hotel gets plenty of sun and we’ve been planting fruit trees along that edge of the woods for the last few years. There are also many apple trees within a few hundred metres around the edges of our Old Field. In spring and when it rains, the security road along the south edge of the woods becomes muddy, giving the mason bees material to seal their nests. These boxes are temporary, so the idea is to unroll the paper tunnels in the fall, gather the cocoons, clean them, and store them in the refrigerator or other cold, but not freezing, place. Bring them out in spring and put them into the back of a new nest box. Although this is certainly interfering with Mother Nature, it also increases the survival rate of these much-needed bees. Alternatively, the boxes can be left in place outside if they are protected inside a wood or plastic outer container or placed in a protected place, such as a garage or shed. 1-litre cardboard carton from milk, cream, etc. Cartons with blue or yellow print or graphics are best. Cut or tear the typing paper in half to make 2 pieces, each 5.5” by 8.5”. Put the 2 pieces together (with printed sides facing in) and position them with a short edge facing you. Tear off 3 pieces of tape, about an inch long, and keep them handy for fastening finished tubes. Once started, continue rolling the dowel up with the flat of your fingers, keeping steady pressure to ensure that the paper is tight against the dowel. As you near the end, pick up the dowel, finish rolling, then secure the tube by wrapping a piece of tape around its middle. Inspect the two ends of the tube and wrap a second piece of tape around the end with the flattest surface, about 1/8″ in from the end. Close the other end of the tube by pinching and taping. To do this, pull the dowel partly out so that its end is about 1″ inside the end of the tube, pinch the end of the tube and close it by taping over the end. It’s important to reduce, as much as possible, the amount of light entering the tube. Finally, to give the female bee more room to nest, push the dowel back into the tube against the pinched end while gripping the pinch with your thumb and forefinger. Paint the ends of 7 of the tubes with light blue paint. When they are dry, distribute them randomly in the bundle of 19 tubes. Hold the bundle together with two elastic bands. Wrap paper toweling around the bundle to insulate the bees against cold nights in early spring and hot days in summer and to prevent the bundle from moving around inside the milk carton. Use seven 2-ply sheets that are 27 x 23 cm each. Fold them in half lengthwise and wrap them around the bundle of tubes with the folded edge at the front. Secure with two elastic bands, if necessary. The shell of the nest is a 1-litre milk carton that contains the insulated tube bundle, the two exit tubes, and the two dowels. With a pair of scissors cut off the 1-cm white border at the top of the carton. If the carton has a plastic spout, cut around it and remove it. Fold the top pieces into the carton and staple them in place. With a box cutter (or exacto knife), cut a V-shaped hatch on the upper side of the carton near the base. This is used to put last year’s cocoons into the carton behind the tube bundle. The two exit tubes, which are placed in the upper corners of the nest, allow the bees to leave the nest after emerging from their cocoons. Make two more paper tubes, as above, but this time use three half-sheets of printer paper and the larger, ½-inch dowel. Leave both ends open. Place the insulated bundle of tubes into the milk-carton shell making sure there is space behind them (under the hatch). Add the exit tubes in the two upper corners. We like to place the dowels in the lower corners to keep them from getting lost and to help hold the bundle in place. Two newly constructed Mason Bee boxes ready to install. Mason Bee cocoons that have been stored in a refrigerator over the winter. Now that the weather is warming (end of April), it’s time to return them to a more natural location. I put the cocoons into the space at the back of one of the new boxes through a small trap door cut in the top of the box. The four larger tubes in the corners of the box are open at both ends. When the bees emerge from their cocoons, they will use these to escape from the box. The two new Mason Bee boxes installed in our insect hotel. The hotel contains “rooms” for other bees, wasps, and insects. Residents have included Leaf-cutter Bees and Grass-carrying Wasps. A Mason Bee exploring another box I made for my own backyard. Success already. In this photo, taken on 12 May, you can see 8 holes in the left box and 1 in the right already filled with chambers holding eggs and pollen and sealed with mud.